Everyone helps out in the way that they can. 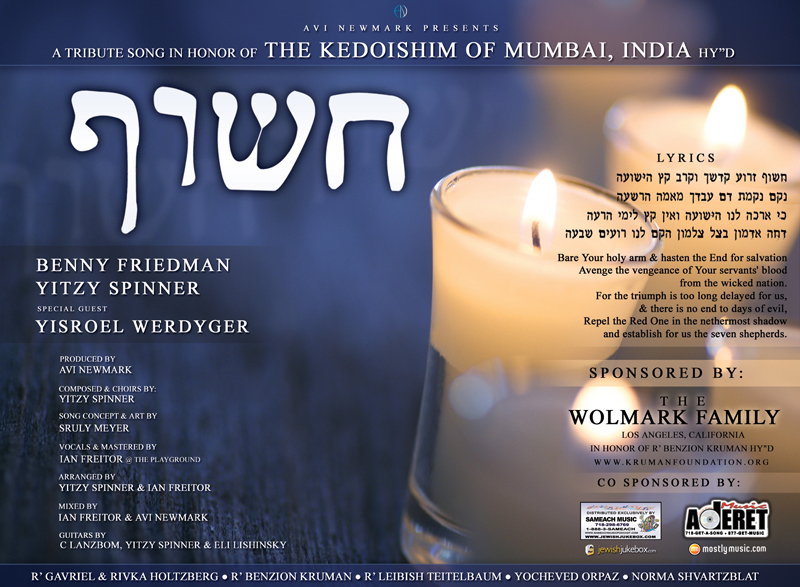 Since I work with many talented people in the Jewish music industry, I wanted to do something musical that would express our feelings on the upcoming Shloishim of the Kedoshim who were murdered in the Chabad House in Mumbai, India. This brand new song, Chasoif, is a free download, made available to anyone who wants it by the generous support of the Wolmark family from Los Angeles, California. Addtional sponsorship provided by Sameach and Aderet Music. It was composed by Yitzy Spinner and produced by Avi Newmark. Singing on this track are Yisroel Werdyger, Yitzy Spinner and Benny Friedman. All the people involved in the making of this song come from different backgrounds. One of the code names I used while discussing this track was “The Achdus Project.” The singers are not just from different communities but different music labels and different music-family dynasties (Benny and Sruly are the nephews of Avraham Fried and Mordechai Ben David, respectively.) I wanted to bring together different people to sing on this song because it is through the Achdus we all displayed in the days during and following the Mumbai tragedy that Moshiach will come. It’s through the Ahava that we display towards each other that we will finally be Zoche to bring this bitter Golus to its long awaited end. The lyrics are from Maoz Tzur, where we implore Hashem to finally bring an end to the seemingly endless suffering visited upon us. A Shliach doesn’t have a specific Mission Statement, or a set of parameters for whom they help and when they help. They don’t have off buttons. Even when the event is over, and the people have left whatever Holiday party took place that night, they don’t become “regular” people. That is what is so unique about a Shliach, he stand as a leaders to us all, no matter our level of frumkeit. Since I was very young I always held a special place in my heart for Shluchim. When I was 14 I had my first experience working for a Shliach. I went with a group of older Bochurim to a Shliach for Yom Tov and helped out with the youth Minyan. Later, when I was about 17, I went with some other Bochurim to Rabbi Dovid Bryn’s Chabad House in the California Club Mall in South Florida. Rabbi Bryn (link) was a shining model of what a Shliach of the Rebbe should be. Quite tragically he passed away far too young, but his kindness and love inspired many others to take over in his place and continue his work. After I concluded with Yeshiva I spent many years working with Chabad Houses, including 4 years in Northern Virginia. I was working in an area where there was a small but loving and warm group of Shluchim within an hour’s ride from one another. I learned so much about not just being a Shliach, but about being a Chassid, a Mentsch and a human being from those years. What these Shluchim may not have known was that they had an influence on me, a frum Lubavitch Bochur, an influence that would help shape my foundation for years to come. It’s because of my close connection with Shluchim that when I heard that the Chabad House in Mumbai was under siege, I felt such a strong personal connection to the situation. I was never in Gavi’s Chabad House, but I was in many others just like it. In that respect they are the same. The door is always open, the food is always over flowing, the warmth is always strong, and the smiles always bright. They are there for you. They are there for me. Seeing that kindness and warmness being violated struck me deep in my heart. As the siege went on I started getting this feeling that I knew Gavriel. I couldn’t place it, but the smile on his face in every photo that flashed across the many websites and TV news programs was strong. I knew that smile. I could just feel it. When we got the terrible news that all the Kedoshim in the Chabad House were murdered, I suddenly remembered where I knew him from. Gavriel was a learning director in an overnight camp the year I was also a counselor. I didn’t know him well, but once I placed where I knew him from, all the memories of him flooded right back. Most of all, that smile. He had such a love to teach and to get people involved. That may be one of the reasons I was inspired to “do” something. Gavriel would run around the camp at very early hours in the morning to get the kids to learn. Dealing with cranky campers in the wee hours of the morning is not an easy task, but Gavriel always had the bright, wide smile on him. He was excited by it. You could see that learning and “doing” something just put him in a special place. This is why I dedicate this song to his passion and his warmth and of course his smile. We should all have the mind set that nothing is too hard and we should do everything with passion and with a smile on our face. Gavriel’s sacrifice and dedication in such a dangerous and remote location will inspire untold numbers of people to realize that no matter how far away you are, you can always be a force for goodness. It’s our wish that while listening to this song you will donate to the Tzedakahs setup to rebuild the Chabad House in Mumbai, help out with the expenses of the Holtzberg’s now orphaned children and the families of the the other Kedoshim murdered in the Chabad House. A Special thanks to everyone involved in this track. When I called, you answered and were eager and excited to jump on board. To Mr. Zevi Wolmark, thank you for sponsoring the track. We shared a vision, and we made it happen. May G-d bless you with continued success in all the good that you do. Thank you Izzy Taubenfeld, of Sameach Music (JewishJukebox.com) and Mendy Werdyger of Aderet Music (Mostlymusic.com) for additional sponsorship. You are a blessing to Jewish music. Thank you for joining forces in honor of these heroes. I also want to thank Avi Newmark, Yitzy Spinner, Benny Friedman, Yisroel Werdyger, Ian Freitor, Eli Lishinksy, C Lanzbom and TeeM Productions. Your enthusiasm in jumping on board was energizing, inspiring, and very much appreciated. This is something I am tremendously proud of, and I hope that this spirit of Achdus will continue and spread, not just through the Jewish music community, but throughout and across the Jewish community and the world. May we only know from Simchas, and may we merit the coming of Moshiach now, when we will really dance to happy news.